The negative consequences of relying too heavily on metrics to assess research quality are well known, potentially fostering practices harmful to scientific research such as p-hacking, salami science, or selective reporting. The “flourish or perish” culture defined by these metrics in turn drives the system of career advancement in academia, a system that empirical evidence has shown to be problematic and which fails to adequately take societal and broader impact into account. To address this systemic problem, Florian Naudet, John P. A. Ioannidis, Frank Miedema, Ioana A. Cristea, Steven N. Goodman and David Moher present six principles for assessing scientists for hiring, promotion, and tenure. Recognising this, many institutions augment publication numbers with measures they believe better capture the scientific community’s judgement of research value. The journal impact factor (JIF) is perhaps the best known and most widely used of such metrics. The JIF in a given year is the average number of citations to research articles in that journal over the preceding two years. Like publication numbers, it is easy to measure but may fail to capture what an institution values. For instance, in Rennes 1 University, the faculty of medicine’s scientific assessment committee evaluates candidates with a “mean” impact factor (the mean of JIF of all published papers) and hiring of faculty requires publications in journals with the highest JIF. They attempt to make this more granular by also using a score that attempts to correct the JIF for research field and author rank. (This score, “Système d’Interrogation, de Gestion et d’Analyse des Publications Scientifiques”, SIGAPS, is not publicly available). In China, Qatar, Saudi Arabia, among other countries, scientists receive monetary bonuses for research papers published in high-JIF journals, such as Nature. To understand the value of a paper requires careful appraisal. Reading a few papers that best characterise the corpus of a scientist’s research offers insights about his/her quality that cannot be captured by JIF metrics. JIF provides information about the citation influence of an entire journal, but it is far less informative for the assessment of an individual publication and even less useful for the assessment of authors of these papers. Journal citation distributions are highly skewed, with a small percentage of papers accounting for a large majority of the total citations, meaning that the large majority of papers even in high JIF journals will have relatively few citations. Furthermore, the phenomenon of publication bias exists at the highest JIF journals, in that statistical significance of results will affect the publication prospects for studies of equal quality. Arguably the most important finding of The Open Science Collaboration’s “reproducibility” project, which chose at random 100 studies from three leading journals in the field, is that with exceedingly modest median sample sizes (medians from 23 to 76), 97% of those studies reported statistically significant results. Clearly, the journals were using significance as a publication criterion, and the authors knew this. This brings us a critical feature in these evaluation systems that threaten the scientific enterprise, embodied in Goodhart’s Law (i.e. it ceases as a valid measurement when it becomes an optimisation target). This happens when the measure can be manipulated by those it is measuring – known as “gaming” – devaluing the measure and producing unintended harmful consequences. In the case of scientific research, these unintended (but predictable) practices include p-hacking, salami science, sloppy methods, selective reporting, low transparency, extolling of spurious results (aka spin and hype), and a wide array of other detrimental research practices that promote publication and careers, but not necessarily reproducible research. In this way, the “flourish or perish” culture defined by these metrics in turn drives the system of career advancement and personal survival in academia that contributes to the reproducibility crisis and suboptimal quality of the scientific publication record. The probem described above is systemic in nature and not an issue of individual unethical misbehaviour. The outcomes of that workshop were summarised in a recent perspective, in which we described an extensive but non-exhaustive list of current proposals aimed at aligning assessments of scientists with desirable scientific behaviours. Some large initiatives are gaining traction. 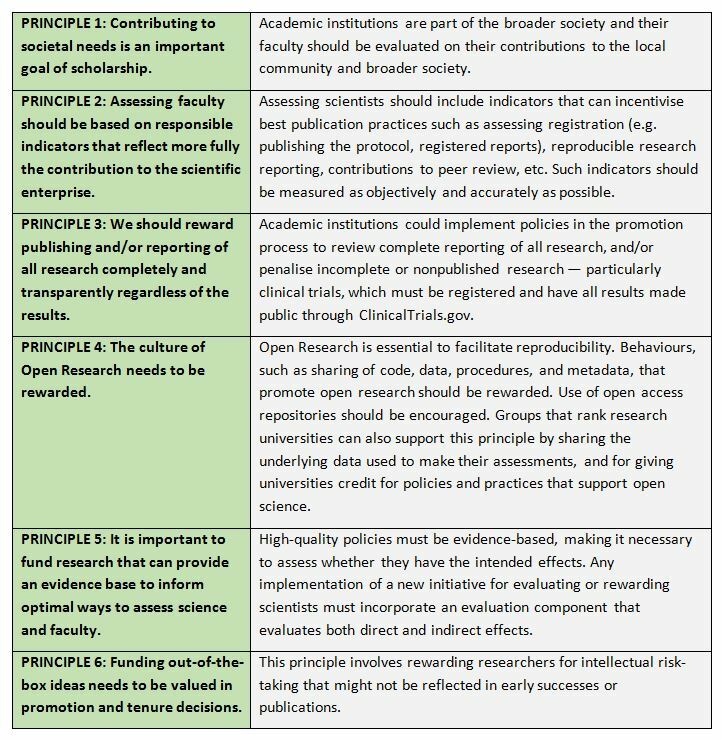 For instance, the San Francisco Declaration on Research Assessment (DORA) has been endorsed by thousands of scientists and hundreds of academic institutions worldwide. It advocates “a pressing need to improve how scientific research is evaluated, and asks scientists, funders, institutions and publishers to forswear using JIFs to judge individual researchers”. Other proposals are still just ideas without any implementation yet. We are at a crucial time in the movement of research reform; a movement that is crossing disciplinary and national borders. There is a window of opportunity now to make changes that were previously thought impossible. It is important that we take full advantage of this opportunity, striking the right balance between promising new approaches and the possible harm in some settings of abandoning current assessment tools, which can serve as a partial buffer against advancement based on personal connections ot claimed reputation. We need to make changes with the same care scrupulous standards we apply to science itself. This blog post is based on the authors’ article, “Assessing scientists for hiring, promotion, and tenure”, published in PLoS Biology (DOI: 10.1371/journal.pbio.2004089). Featured image credit: Daniel McCullough, via Unsplash (licensed under a CC0 1.0 license). Florian Naudet is a psychiatrist, meta-researcher, and former post-doctoral fellow at METRICS. He’s currently teaching Therapeutics at Rennes 1 University, France. His research interests are evaluating and developing methodological solutions to assess treatments in patients, primarily but not exclusive in psychiatric research. He has a strong interest in studying research wastes and data sharing practices. He has worked in the fields of clinical pharmacology, research methodology, epidemiology, and neurosciences. His ORCID iD is 0000-0003-3760-3801. John P. A. Ioannidis is the C.F. Rehnborg Professor in Disease Prevention, and Professor of Medicine, of Health Research and Policy, and of Statistics. Dr. Ioannidis is internationally recognised as a leader in empirical studies assessing biases, replication, and reliability of research findings in biomedicine and beyond. He has served as President of the Society for Research Synthesis Methodology, Senior Advisor for Knowledge Integration at the National Cancer Institute, editorial board member of 30 leading international journals and Editor-in-Chief of the European Journal of Clinical Investigation. He is one of the most-cited scientists worldwide. His PLoS Medicine paper on “Why most Published Research Findings are False,” has been the most-accessed article in the history of Public Library of Science with over 1 million hits. Frank Miedema is a professor of immunology and dean/vice-chairman of the Executive Board of University Medical Center Utrecht, The Netherlands. For more than 20 years he worked on HIV pathogenesis, especially the role of anti-HIV cellular immunity in disease protection. As dean he inspired the development of a new UMC Utrecht strategy focusing on societal impact of research programmes and stakeholder involvement. Together with a group of distinguished scientists, he launched the Science in Transition initiative in the Netherlands. Science in Transition argues that science is in need of fundamental reform. Bibliometric quality assessment should be replaced by domain-specific, alternative analyses. Furthermore, scientists should involve societal stakeholders in formulating their research agenda. Ioana Cristea is an Associate Professor at Babes-Bolyai University, Romania and a previous Fulbright Visiting Scholar at METRICS. She is trained as a clinical psychologist and has previously worked at the universities of Pisa and Padova, Italy. Her research focuses on critically appraising the efficacy of various psychological and pharmacological interventions for mental disorders, as well as well the role of financial and non-financial conflicts of interest. More generally, her work includes a focus on issues related to transparency, rigour, and waste in clinical research and in psychological research more generally, using both quantitative and mixed approaches. Steven N. Goodman is Associate Dean of Clinical and Translational Research and Professor of Medicine and of Health Research & Policy, directing Stanford’s CTSA training programs in medical research methods and serving as chief of the Division of Epidemiology. He has been a senior statistical editor of Annals of Internal Medicine since 1987 and was Editor of Clinical Trials: Journal of the Society for Clinical Trials from 2004-2013. He is Vice-chair of the Methodology Committee of the Patient Centered Outcomes Research Institute (PCORI) and since 2004 has been scientific advisor for the national Blue Cross–Blue Shield Technology Assessment Program. David Moher is a senior scientist, Clinical Epidemiology Program, Ottawa Hospital Research Institute, where he directs the Centre for Journalology. Dr Moher is also an Associate Professor, School of Epidemiology and Public Health, University of Ottawa, where he holds a University Research Chair. He leads an active research programme investigating: how to reduce waste and increase value in biomedical research; biomedical reporting guidelines; predatory journals and publishers; core competencies for scientific journal editors; open science; and how to assess scientists. His ORCID iD is: 0000-0003-2434-4206.